I have been researching my family tree for over 15 years now. In the early days it wasn’t so easy, and I probably had the sum total of about 10 names. The advent of the Internet has changed all that, and I now have four large arch files of information, including one entire file dedicated to one family member – more on him in a later post. I have gone as far back as the late 1500’s in Fylingdales and Robin Hood’s Bay in Yorkshire (the further you go back, the more difficult it gets), and can pretty well trace the family right down the male line to now, with a recent start being made on tracing the maternal lines back from my mother, and my Great Great Great Grandmother. A surprising find, in a site of graveyard inscriptions, were the names of not only my long searched for Great Great Great Grandmother (Clara Pickhills nee Rickinson), but also her husband (Joseph Pickhills), one son (Seth Pickhills) and daughter (Priscilla Pickhills). This was a great find as it connected me further back than my Great Great Grandfather (Rickinson Pickhills) and filled in a few blanks. I had to use a research company to find details, as the trace is difficult if you live in Australia. 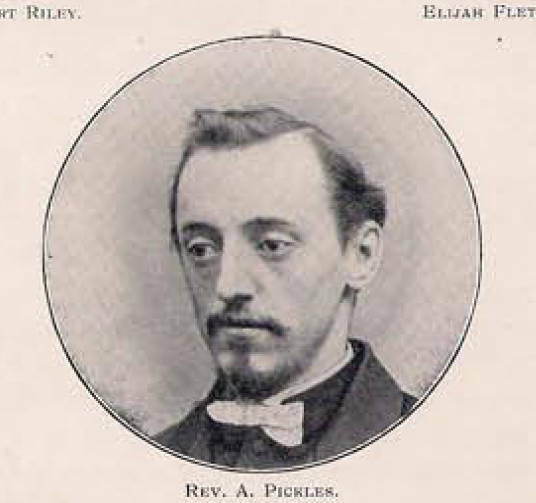 Clara’s son Seth Pickhills had one son – Alfred – who is important for two reasons (he is my first cousin three times removed). Firstly that he took off down his family line using Pickles instead of Pickhills – and I guess we will never know why. For a while in Rochdale (Lancashire) he lived with his aunt (Priscilla) and she was a Pickhills. Secondly, and the very last thing I would ever have expected to find in my family, after a stint at being a watchmaker he became a Baptist Minister in Rochdale. And here I was thinking that we had always been Catholics! I don’t know when religious affiliations changed, but I suspect it was after the families arrival in Australia, and probably after some Irish heritage had been added by way of the lineages of the Fanning’s and the McConnell’s. With Catholic’s being unable to marry outside the faith, potential spouses of other religions would have had to convert. Thankfully, my family never cared one way or the other, and despite being christened a Congregational, I am now a devout Atheist. Anyway, this much we do know about Alfred. He was born in the rapidly growing West Riding textile town of Bradford, Yorkshire, in 1843. The son of Seth Pickhills and Jane Bracher, we know little of their actual lives except that they were working class. Seth was a journeyman printer (journeymen, after serving their apprenticeship, were able to move amongst employers), and according to the 1851 census the family were living in Belgrave Place in Bradford, and 8-year-old Alfred was a scholar. Moving on 10 years to the 1861 census, we know that he was 18-years-old, and living with his aunt, Priscilla (Seth’s sister) at 46 Belgrave Place, Bradford, and that he is listed as being a watchmaker. Seth had died in 1859, and it would appear that his sister had taken over the running of the household, though we are unsure of what had happened to Jane. His next mention in the records is in the 1871 census, and both he and Priscilla had moved to 95 Mitchell St in Rochdale, and he was listed as being a Baptist Minister. We know from his memoir printed in “Memoirs of Ministers and Missionaries who died between 15th January 1917 and 31st October 1919” that he was involved with the Baptist church from a young age, and he became a member of Westgate Church in Rochdale under the pastorate of Henry Dowson, whose teachings had a lifelong influence on him. In 1874 he married Margaret Elizabeth Shepherd, who was born in Waterbarn, Lancashire in 1844. The couple had two children whilst living in Rochdale – George (1876) and Henry Shepherd (1878). Initially, Alfred’s ministry consisted mainly of cottage and outdoor meetings. He became one of the earliest students of the Baptist Theological Institute, which at the time was newly established at Chamber Hall in Bury, and under the presidency of Henry Dowson. In 1866 the Institute moved from Bury to Manchester and became the Manchester Baptist College, founded on strict Baptist communion lines. 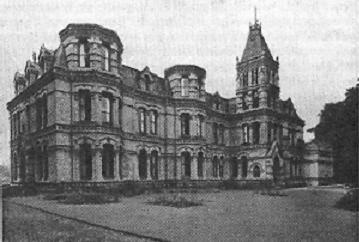 The College was to become a founding member of the Theological Faculty of Manchester University. Alfred’s name was the first on the roll of minister’s trained at the college. His pastoral work began in 1870 at the Lyceum in Rochdale, and soon afterwards at the church purchased in Water Street, Rochdale. This was to become the Water Street Ebenezer Baptist Chapel. During the pastorate of Alfred the congregation grew and prospered. On the evening of February 10, 1878 the Reverend gave a long lecture to his congregation entitled “Turkey, Russia, England and the Jews” which was published in booklet form shortly after. He was also secretary of the local branch of “The Liberation Society”. The society had been formed by Edward Miall (8 May 1809 – 30 April, 1881) who was a Portsmouth-born journalist, apostle of disestablishment and a Liberal politician. He was also a Congregational minister at Ware, Hertfordshire (1831) and Leicester (1834), and in 1841 founded ”The Nonconformist”, a weekly newspaper in which he advocated the cause of disestablishment. Miall saw that if the programme of Nonconformity was to be carried through it must have more effective representation in Parliament. One of the first fruits of his work was the entrance of a John Bright into parliamentary life; and by 1852 forty Dissenters were members of the House of Commons. This was due largely to the efforts of the British Anti-State-Church Association, which Miall was instrumental in founding in 1844. It was renamed in 1853 as the Society for the Liberation of Religion from State Patronage and Control, known for short as the “Liberation Society”. The Society was never able to secure a parliamentary majority for the disestablishment of the Church of England, but the long fight for the abolition of Compulsory Church Rates was finally successful in 1868. In 1870 Miall was prominent in the discussions aroused by the Education Bill. He was at this time Parliamentary member for Bradford (Yorkshire) from 1860-1874, having previously sat for Rochdale (where Alfred would undoubtedly have encountered him in person) in 1852-1857. In 1874 he retired from public life, and received from his admirers a gift of 10,000 guineas. He died in 1881 at Sevenoaks in Kent. After ten prosperous years at Water Street Chapel, throat problems forced Alfred to accept a call to Towcester, in Northamptonshire, which was more rural and had a milder climate. He officially became pastor after a three month trial period. However, it would seem that this move to the North End Baptist Chapel was to have its own trials and tribulations. The chapel at Towcester was opened on 3 October, 1853. There appears to be little interaction with other churches in the area, though the Towcester Baptist Church does record that after re-forming in 1871, it received a letter from the North End Chapel to “renew contacts severed with the old church, as the basis for fellowship was now seen to be biblically established”. What was often referred to as “the Baptist Church”, almost as though it were a separate denomination, later came to be known as the South End Church, though there appears to be no desire to unite the two churches on the part of North End. Most of what we know of Alfred’s pastorate is from the Church Book. The Church Book was used to record baptisms, reception of people previously baptized by the laying on of hands, expulsions, and rebukes of a serious nature. Under the previous pastorate of Samuel Cooper Tite, the book had not been filled out prior to the 1880’s, and he had in fact taken the book with him when he left the church. He returned the Church Book to Alfred in 1886, after his return to the Baptist church. There was a fairly small congregation, possibly due to it being a sect of the Baptist church commonly referred to as Johnsonian Baptists. Founded by John Johnson (1706-1791) who was a Baptist Minister of High Calvinist views, he taught that faith was not a duty required of God, but a grace which it is impossible to convert into a duty. Want of faith, therefore, is no sin. He was repudiated by the local association for “bizarre ideas” , as he questioned whether the Incarnation would have been necessary if man had not sinned, he denied the doctrine of the Trinity, and was highly insular and exclusive. Johnsonian’s were not even allowed to associate with other Baptists, which would have explained the division between the two Baptist churches in Towcester. Other Johnsonian churches were founded in Blackburn, Norwich, Chesterfield, Halifax, Bromley, Duncote and Dublin. In Towcester, for the 64 years leading up to Alfred’s appointment, about 80 people were associated with the church at one time or another. In 1886 there were 37 members, and Alfred baptized 20 in the 6 years since he became pastor. With the return of the Church Book, he started to record church meetings and one or two other “events”. There is a record of a visit from a person from a nearby congregation to communion “at the Lord’s Table October 2nd 1887 Mr Davidson a Member of the Church of Christ at Banbury requested and was allowed to commune. At the request of the Church he also preached in the evening from 1 Cor 15c 1 – 4 vs”. This is obviously an “Event” and reveals the small congregations isolation. The Churches income was about ₤20 per year, which appeared to cover their expenses. A welcome gift mentioned in the Church Book is of an amount of ₤100, which was on its way in five installments from the sale of a church in Comus Street, Liverpool. In the meantime, Alfred and Margaret had another two children – Thomas Edward (1881) and Ruth (1884). The family first appear in Towcester in the 1881 census, living in High Street. Alfred and Margaret are listed along with George who is 5-years-old; Henry who is three; infant Pickles (Thomas, and just born); a Maude Clegwidden who is 12-years-old and occupation given as nurse maid (at 12?) born in London, Middlesex; and a Margaret Taylor, 68-years-old and a visitor. Alfred appears to have left his position as pastor of North End Chapel in 1891. The church may have been too small to warrant a pastor at that point, as thirteen members passed the following resolution at a Church Meeting towards the end of 1891 “that in harmony with the suggestion of the Trustees, we request Mr Fidler to preside at our Church Meetings and to advise and assist so that the Services at North End & Duncote Chapels may be maintained in as orderly and efficient manner as possible. Signed by Alfred Pickles. Pastor.” William Fidler accepted the invitation. By July 1893 there was obvious concern about the viability of the Church. Many of the church members had been elderly and had died. The Sunday School had just 11 pupils. A church meeting was held with 8 people present which decided to try to carry on for another few months. “There appeared no disposition to unite with the South End Church. Still the prospects of continuing as at present were doubtful. Mr Garlick was specially anxious that they should try to revive the work by prayer and united effort”. Early in 1894, after the services had been held in the vestry for all winter to save money, the church was officially closed on March 25. There were 16 members listed, 4 of which were discovered to have died. The contents were distributed between the Duncote Chapel, and Towcester Baptist. Church (South End Chapel). Obviously they weren’t too proud to take a donation from a church with opposing views to theirs. In the 1891 census, Alfred and Margaret are listed as living at 19 The Drapery, Northampton. George is now 15 and an apprentice; Henry is 13 and a school boy; Thomas is 10 and a school boy; and Ruth, the new addition since the last census, is 7 and listed as a “school boy”. Margaret Lyack, 66-years-old, is living with them as a boarder living on her own means. 19 The Drapery (a store) is still there, and currently occupied by Oxfam. I think Alfred would like that. For the following 6 years, after the official closure of North End Chapel, Alfred travelled from Northampton back to Towcester every Sunday in order to break the bread of life for the Towcester Church, this being done for no renumeration. Another interesting item that came out of the 1891 census is that Alfred’s occupation is listed as a “Hatter & Hosier” at 19 The Drapery, and he is also listed as a Hatter in two directories of Northampton for that period. However, I am led to the thinking that this was the year they moved to London, possibly in the latter half of that year.. A notice appeared in the “Edinburgh Gazette” dated August 4, 1891 whereby in a listing taken from the “London Gazette” he was listed as bankrupt whilst living in Northampton. We know that at the time of the first meeting and first examination regarding his bankruptcy that he was residing at 160 Regents Park Rd, London, though he returned to Northampton for these meetings. He was still at the Regent’s Park Road address in 1893, when the Public Trustee Alfred Lister Blow was acting on his behalf. It is open to suggestion as to why he declared himself bankrupt. One reason may be that he used all his available cash trying to keep the North End Chapel viable. Another reason might be that with the church being so poor, and with him having to resign his position as pastor (and receiving no pension or renumeration) that there was just no money left for him and his family to survive on until he either obtained work, or started his own business. Who knows! I have tried researching the prevalence of bankruptcy in the 19th century with little success. Alfred is the second family member to have declared bankrupcy. He also started work for the Baptist Tract and Book Society, where he worked for some years. still preaching whenever and wherever he was needed. By the time the 1901 census rolled around, he was residing at 10 Oppidans Road in Hampstead. He is listed as a “Tay Dealer” which I can find nothing about, and suspect it is a deciphering error. Margaret is still listed, as are George (now 25, single and a clerk); Henry (now 23, single and a printer); Ruth (now 17, single and a shop assistant); and Thomas (now 20, single and a printer). They still have a boarder, now an Edward Gounersall, a 24-year-old single electrical engineer. By now Alfred’s eyesight was failing, and The Memoir notes that for several years before his death he was quite blind, and bore it with great patience. It would appear that he did continue to work, possibly as a hatter and hosier seller (perhaps Ruth was a shop assistant in his store), as well as continuing an occasional ministry for as long as his failing eyesight allowed. Margaret died in 1911, and I think this would have devastated him, as he had described her as “a true help in all his labours”. At the time of the 1911 census he is living at 23 Ainger Road, St Pancras in London. He is listed as a Baptist Minister Retired. Thomas Edward is still with him at 30, and it would seem still single and now a Painter Machine Manager. Ruth is also still listed as being with him at 27, and it would seem that she also is still single and now a costumier. Alfred died in his sleep (according to The Memoir, which can tend to prettify things) on the 20 February 1920, aged 72, at Hendon. He left behind a family who cherished his memory. “He was a man of faith and prayer, and faithful to the principle, even when fidelity meant loss. His one passion was to preach the gospel and he has now gone to hear his Lord’s “well done” and receive the reward of many soul’s for his hire”. It would appear from The Memoir that he was a very committed and devout man. Although research continues into this side of the family, it would appear that only two of Alfred’s children married. The 1911 census lists at 10 Oppidans Road in Primrose Hill in London a George Pickles. He is now 35, in the Motor Accessory Trade, and head of the household. His wife is Mary Ellen Pickles who is 39, and born in Co Kildare, Ireland (a resident of Clonkeeran). They have been married for 8 years, though no children mentioned. Thomas Edward appears in the 1917 register of marriages for St Savior in Hampstead. He is 35 and marrying a Mary Turner who is 29. There is a listing for Thomas E Pickles Death in 1965 in Greater London, though if this is indeed Thomas Edward is yet to be verified. He was 84 at the time of his death. There is a death registration for Ruth Pickles, aged 81, at Sidcup in Kent. Again, this needs to be verified. Further to the Water Street Ebenezer Baptist Chapel in Rochdale. The Water Street Chapel was demolished in 1915, and the demolition was witnessed by a parishioner by the name of “Owd Dob “who was inspired to write an account of his personal memories of the chapel in a short treatise entitled “Th’ Owd Chapel”, for private circulation. It is difficult to read as it is written in the Lancashire dialect, though with perseverance an interesting account of the chapel (including a mention of the pastorate of Alfred Pickles at the beginning) unfolds, and includes a picture of the Church, its banner, a sketch of its interior, and photographs of pastors, the choir and the woman’s class – all looking very “Baptist” in their 19th century severity. This biography has been put together using information gleaned from census records, Alfred’s memorium in The Memoir, and various newspaper reports from the time. Some suppositions have had to be made, and I hope that some of my conjectures at least are correct. It has been an interesting exercise cobbling someones life together from whatever information is still available. At this time I am still waiting to hear from Northamptonshire Archives of any information they may have on file for Alfred. NB: they never got back to me. There is a payment request for searches on their web site, but I am nit willing to pay money to find they either have nothing, or I already have what they hold. A request to know if they have any information on Alfred before I pay has been ignored. This is the first archive in England to be unhelpful with an information request. I would personally like to thank Emily Burgoyne from Regent’s Park College Library at the University of Oxford for abridging the “Memoirs of Ministers Who Died Between 15th January 1915 and 31st October 1919” and sending it to me (the Memoir itself is the only copy and is in to fragile a state to scan. It was compiled by the Baptist Union after they decided to stop printing the Baptist Union Handbook during the First World War, as paper was scarce, and printing expensive), along with scanning in his lecture “Turkey, Russia, England and the Jews”. It has all been an invaluable aid in helping to trace my long-lost cousin.